THE DELAYED WORK permit kept the All Black scrum-half coiled up and ready to spring from Munster training for long enough. Alby Mathewson made sure the long wait was worthwhile. A veteran of the Hurricanes, Blues, Western Force and most recently Toulon to complement his five New Zealand caps, Mathewson already looks more than just a useful stop-gap solution in the absence of Conor Murray. He went about his business with a swagger against Ulster on Saturday, with seamless passing from the ruck and signs 0f a relationship with Joey Carbery that could blossom very quickly. A revealing highlight came when Mathewson collected a ball kicked to touch 10 minutes in. The Kiwi rugby DNA in the Hastings man meant he immediately looked at the full field layout. The space was glaring on the far side and he arched back to send up a spiralling one-handed pass to Rory Scannell, cutting out 12 white jerseys in one fell swoop. “With that quick throw-in,” Johann van Graan says, “some of the guys said; ‘no, listen, slow down!’ And he threw it. “The brilliant thing to me was the action of the other 14 guys when he threw it. Mathewson’s skill-set will surely be called upon in Munster’s attacking gameplan against a Leinster defence that looked nigh-on impregnable last time out in Galway. Leo Cullen’s men continually frustrated Connacht by filling the line with 13 bodies, but whichever half-back combination Munster select for the Aviva Stadium, exploiting the space in behind will be far easier said than done. “They don’t really commit a lot of guys to the breakdown,” adds the South African. “They are very comfortable to defend 10, 20 or 30 phases and once they get that turnover they punish you. A lot of teams have come with different things against them: some guys try to keep the ball in hand; some guys go to the air; some guys went with a breakdown focus and some guys went in with a variety of stuff. I think the important thing for us is that we play our game. It seems unlikely that Carbery will hold the responsibility of building that scoreboard pressure as Mathewson’s half-back partner this Saturday. 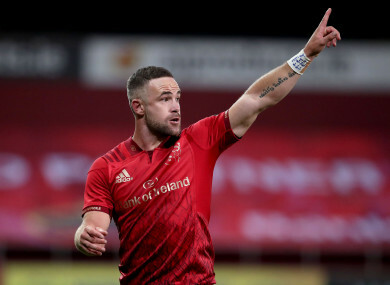 The Athy man has started the last three games for Munster and, with Europe ahead, retaining his place this weekend would put him on course for six straight weeks in the firing line. That sounds like a positive for Carbery’s development as a 10, but is equally at odds with the IRFU’s player management programme when the November Tests are so close. So another Leinster old boy in Ian Keatley will have a key role to play. As a player or just as a voice in the team room, Van Graan insists he won’t be leaning on Carbery’s inside knowledge of his former club. “I’m certainly not going to ask him for all the names of their moves and the way they do things. I believe this is a new game, a new season and team moves on. If our focus was to get information out of Joey then I don’t think it’s the right way to go about things. “It’s about us and the way that we want to move forward. I believe if you focus so much on those things you will kind of chase your tail… his integrity is so good so it’s not even a question that I’m going to pose to him or that we’re going to pose to him. Email “'That quick throw-in, some of the guys said; 'no, slow down! '': Mathewson an exciting addition for Munster”. Feedback on “'That quick throw-in, some of the guys said; 'no, slow down! '': Mathewson an exciting addition for Munster”.